A tempting invitation in my inbox. An evening of multicultural music, poetry and food at the next Swietlica Open Day on Monday 3 October. It’s the winning combination that draws crowds to the friendly gathering at Fort Community Wing and so I’m very sorry to miss this event but other members of Leith Open Space will be able to join in. Joining-in is what the evening is about. This time the programme links the work of Polish artists and musicians with Scotland and other European countries. Swietlica will be marking the centenary of Polish poet, Czeslaw Milosz with a performance of his work by Scottish poet Ken Cockburn who will also explain his recent project in partnership with the Polish Consulate in Edinburgh. There will be a photographic exhibition on the theme of migration including work by Radek Slomnicki. Traditional folk music of Eastern Europe offers another chance for the audience to join in with the singing duo TOCZKA introducing music from Ukraine, Russia and Georgia. 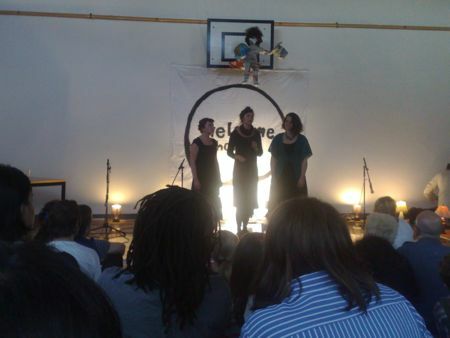 (The picture, by the way, shows the Ukrainian choir Chrząszcz at the Welcome Home Refugee Night in June). And as always food is a central part of the evening. Once again World Kitchen cooks are invited to contribute dishes to the spread. If I hadn’t already got my tickets booked to Spain I would certainly be there too but I will raise a glass at 6.00pm (7pm Madrid time) over some tapas maybe when the doors open at Fort Community Wing. Cheers.